An award winning conservation project set in 28 acres of beautiful bluebell woodland with adjoining garden, fields, ponds, hedgerows, willow plots and poly tunnel. Supported by a small dedicated team of staff and volunteers, the Poulton Wood Rangers are involved in traditional coppice management, coppice crafts and woodcrafts, nature studies, horticulture and all round practical conservation. 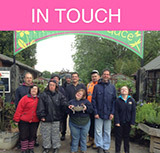 We offer accredited City & Guilds training in both Woodwork and Conservation and a personalised range of 1-1 sessions for those with more complex needs enabling them to access the beautiful natural sensory environment of Poulton Wood. Beautiful spring flower displays, fabulous fungi in autumn, interesting sculptures in the woodland and garden, seasonal produce and crafts for sale. Commissions are taken all year round for carved signs and other woodcraft products. As a direct result of our good work undertaken within the woodland, Poulton Wood was designated a Local Nature Reserve in 2001. We are open to the public 7 days a week, and has become a much loved community resource. The Poulton Wood Rangers are well integrated, well known, and appreciated by the local community for the work that we do.